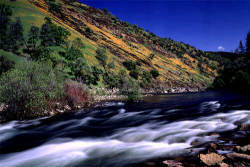 The South, Middle & North Forks of the American River are managed by various government agencies. This page covers the permit requirements, including information for rafting and camping on the American Rivers. Please contact the appropriate permitting agencies for additional or updated information. Plastic private boater permit tags, required by county ordinance, should be displayed on all water craft. Available at Coloma State Park, Camp Lotus, and Chili Bar put-ins, these free tags contain information about health and safety guidelines, and include a river map showing public and private lands, port-a-potty locations, campgrounds and quiet zone boundaries. El Dorado County is the South Fork's permitting agency, and policies are guided by a River Management Advisory Committee composed of four landowners, four commercial rafting outfitters, and one private boater. "Quiet zones", stretches of river where loudness is illegal, are an example of a way that rafters and riverside residents or Coloma Park visitors can share this public resource. Private boaters (when parties share trip costs instead of paying a fee to an independent party) are not required to obtain a permit to raft on either of these rivers. However, if you are planning on camping in one of these river canyons, a wilderness camping permit is required. Be aware that small portions of land in the Middle Fork canyon are privately owned; please take advantage of one of the many scenic camps located on public lands between Kanaka Rapid and Upper Ruck-A-Chucky Falls. Camping on the North Fork is limited to designated campsites. The North and Middle Fork are contained within the Auburn State Recreation Area, which is managed by the California Department of Parks and Recreation. Permits are available through the Regional Headquarters of the California State Department of Parks and Recreation (916) 988-0205 .